Rajasthan Patwari Syllabus PDF:- Applicants who are preparation of Rajasthan Patwari Exam 2019, We have advice for them that the Rajasthan Staff Selection Board release the RSMSSB Patwari Syllabus 2019. We have given the complete information regarding it. They can access Rajasthan Patwari Syllabus & Exam Pattern also. So for more updates tune here. The exam authority RSMSSB disclose the Rajasthan Patwari Syllabus 2019. Candidates can access the RSMSSB Patwari Syllabus 2019 Subject Wise. The Raj Patwari Syllabus Pattern help in the exam of Patwari. Aspirants who are searching RSMSSB Patwari Bharti Notification 2019 and start their exam preparation to crack this exam then they can access their exam pattern also. We have provide the RSMSSB Patwari Syllabus PDF. We have provide many subject syllabus like as General Knowledge of Rajasthan, Geography, Daily Science, Mathematics & English and many more. The RSMSSB releases various vacancy for Patwari. Rajasthan Staff Selection Board has been upload the RSMSSB Patwari Syllabus PDF in Hindi. Contenders who have submit their form, Now they are access the Rajasthan Patwari Exam Syllabus PDF and start their exam preparation to secure selection. The authority releases official update regarding RSMSSB Patwari Pre Exam Syllabus 2019. So stay aware and make continue exam preparation. This exam consist various subject in the Rajasthan Patwari Syllabus 2019. We have given below the complete exam pattern & syllabus pdf also. 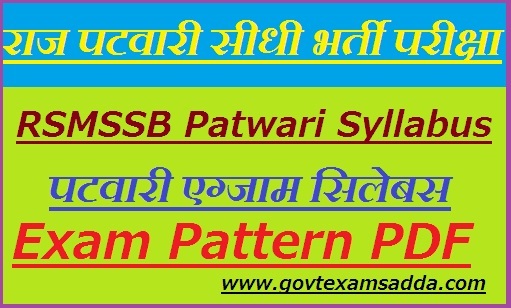 Aspirants can check the RSMSSB Patwari Exam Pattern 2019. through this Exam Pattern of Patwar, You can take a rough idea regarding exam like as total no of questions, exam marks, subject etc. These both stages Rajasthan Patwari Exam Pattern 2019 Prelims & Mains is available in below table don’t worry in both stages of exams questions will appear in numerical form. There will be total 180 question in Pre exam. In the Patwari Main Examination, There will be total 150 questions also. Each question have 2 Marks. There will be also 1/3 marks for each wrong answer. Aspirants who are spending time in study should ensure officially Rajasthan Patwari Syllabus PDF 2019 in Hindi. There is various applicants who will be applied for 4400 vacancies of this recruitment and they all will be filled on basis of respective candidates marks in Pre and mains examination. You will be unhappy after exam when receive scores not as need to clear this exam so make clear available sense by have more time spend with preparation for that. RSMSSB Patwari Syllabus 2019 PDF download is already available at official site. If you have any query or suggestion than comment us.